Get the GoodStuffNW RSS Feed! "In response to the lack of coverage of the social movement in Oaxaca by the mass media, young artists have taken to the streets. These young people have reclaimed urban art. In their works and on the walls in the cities, they portray the repression and the demands of the popular movement. Therein lies the value of their work as art and as a medium of communication. It is one of the strongest ways information is distributed concerning what has happened in Oaxaca." There will also be speakers presenting the art and explaining its political meaning, as well as giving an update on the situation in the region. 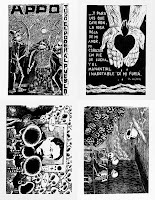 Details: Arte Insurgente: Stencil Art and Woodcuts from Oaxaca, Mexico; Liberty Hall, 311 N. Ivy. Reception starts at 1 pm, Sun., Feb. 4. Our corner of NE Portland is turning into a global restaurant mecca, with taquerias and Thai spots elbowing each other for room amidst the European, African and regional American places on Alberta and Mississippi. But one thing that's been in short supply has been a cheap source for some of the good stuff from the Middle East. Grolla on Killingsworth has a few offerings from the region, but they're not open for lunch and their pricing is definitely upscale. So it was with great delight that we finally checked out Aladdin's Cafe after hearing about it from a few neighbors who are big fans. Just north of McMenamin's Kennedy School and stuck onto one end of a rundown Food Villa store, it has good parking and a clean and pleasant if simple interior. But what'll bring you to this outpost of Syrian cuisine is the bubbly and puffy pita that's brought to your table as soon as you're seated and the mezza of humous, baba gahnouj, tabbouli, dolmas and falafel. The humous and baba gahnouj are very good, and the tabbouli is made the way I like it, with more parsley and less bulgur and dressed with a tart, lemony dressing. Tearing off chunks of pita and scooping up some humous and tabbouli has got to be one of the planet's great delights. The dolmas are also very good but are served cold and would benefit from some warmth, if only at room temperature. But the falafel are really outstanding, with a crunchy outer coating around a moist, flavorful interior. Served with a smear of tahini, these rock. The rest of the menu is decent as well, with the usual assortment of Middle Eastern sandwiches and kabobs, and some Syrian specials making an occasional appearance. The quality and price are going to make this a definite alternative on those I-don't-feel-like-cooking nights, so welcome to the 'hood, Aladdin's! Details: Aladdin's Cafe, 6310 NE 33rd; Phone 503-546-7686. Had coffee one recent morning at the Busy Corner, a little cafe hidden away on a corner in the Woodstock neighborhood. It reminded me of one of those odd handmade spots you find in some college towns or in villages in Europe with a coffee bar on one side, a scattering of mismatched tables and a shelf of dry goods where the neighbors can pick up a jar of red sauce or a package of soup beans for dinner. The coffee drinks are served in the French manner, in large white bowls that are warm and comforting to hold, and they have a small selection of homemade pastries and a few breakfast offerings that can be made on the two-burner hot plate on the back counter. They also have some simple lunch and dinner items, as well as a reservation-only Friday dinner that is creating some buzz in the foodie community, so count on hearing more in the near future! 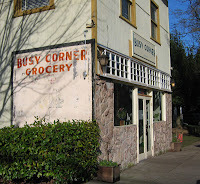 Details: Busy Corner, 4927 SE 41st Ave.; Phone 503-777-5101. 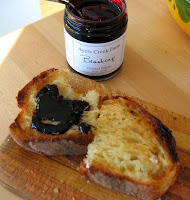 Our friends Monique and Kevin came over for dinner the other night and, while I'm not a big hostess-gift person (a bottle of wine seems like plenty to me), brought us a wonderful jar of blackcap jam made by Ayers Creek Farm. The next morning I was looking for something to have with my coffee and toasted como from Grand Central and pulled it out of the cupboard. Let me tell you, opening this was like an explosion of distilled summer with its almost black color and deep, rich berry flavor and aroma. Ayers Creek is a small organic farm in Gaston that is owned by Anthony and Carol Boutard and specializes in berries, beans, melons and grains. Their produce is used by several prominent local restaurants and is carried in local Whole Foods stores, and their jams can be found at both Pastaworks locations. During farmers' market season, they are regulars at the Hillsdale Farmers' Market. I'm definitely going to be seeking these folks out, so check back in for an update. In the meantime, get some of this incredible jam for yourself. It's amazing! One thing you should know about me is that I'm a complete sucker for dim sum. Maybe it's the allure of those mysterious little noodle-y edible packages veiling the bite-sized, succulent treasures inside. Or the smoky meat-and-rice combo wrapped up in a large leaf. Short of the chicken feet that any respectable dim sum palace has on their carts, I adore it all. 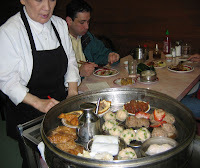 My favorite dim sum in Portland is at Fong Chong in our teensy Chinatown neighborhood. I like its unpretentious charm and the waitresses that have been there for decades pushing the same funky carts around the room. Though there's been talk lately that Wong's King out on SE Division has a better selection, I find Wong's large, brightly lit room on the sterile side, and the quality of the food no better. Plus waiting in line for an hour for someone to call your number is just not worth it when you can walk into Fong Chong and get a table anytime. And when you're in the neighborhood it's always fun to walk by one of the Chinese association doorways and try to peek in an open door. I would so love to go inside one someday! Details: Fong Chong & Co., 301 NW 4th Ave.; Phone 503-228-6868. And I return with a message of bounty. My friend Kathryn and I ventured out to deep Beaverton to explore what's being termed the flagship store of the New Seasons group and, man, is it BIG! It looks like they've modeled it after Whole Foods, with its neat stacks of fruits and vegetables, the helpful attendant at the cheese counter, the separate (and beautiful) displays of meats and fish. It's definitely a shift away from the more neighborhood-y and intimate feeling you get at the Concordia or Seven Corners stores. That said, all the employees at this mega-store are the same smiling, helpful folks you see at their other stores, which makes the shopping experience a pleasure. I don't know about you, but I've thought that if we ever moved out of the area, New Seasons would be one of the places I'd miss the most. And I've heard from friends who have moved away that, even in affluent communities, there is no other store that fills the same spot in their hearts and stomachs. Hats off, guys, and keep up the good work! Woo hoo! Now you can get an RSS feed of GoodStuffNW! What the heck is an RSS feed? Well, it's a machine-readable version of the blog that can be picked up and displayed on other websites and by information aggregators. What it means to you is that when you subscribe to the blog, you'll be notified when new content is added. There are several of these aggregators (or Newsreaders) like FeedDemon (Windows), Bloglines (web-based and free), Shrook (Mac OSX, also free) and NetNewsWire (Mac only). More are listed at AtomEnabled. The browser I use, Firefox, allows me to subscribe to feeds through the bookmarks I already have, so I don't need to use an outside service. It'd be worth checking your browser to see if it has that same capability. In any case, now you can stay updated and in-the-know when something new is posted. Just click on the "RSS Feed" link above or on "Subscribe now" in the right-hand column. What a great idea! 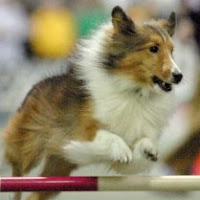 The next couple of weeks have a distinctly canine focus, with the Rose City Classic dog show coming up starting on Jan. 18 and continuing through the 22nd. And though I detest the Expo Center, it's become much easier to get there and avoid the park-and-ride-the-shuttle hassle by taking the direct Max line that drops you off right in front. This is cheap family entertainment featuring all kinds of breeds I guarantee you've never seen before, and they're all walking around the floor coming and going from the various judging rings. And if you want to feel badly about your own canine couch potato, take in some of the agility and obedience trials. These dogs (and their owners) are amazing, and the dogs seem to genuinely enjoy the heck out themselves. Then, if you want to see how true-to-life the movie Best in Show is, wander back into the prep area (it's open to the public) and watch the breeders and handlers fluffing and buffing the dogs to within an inch of their lives. What a show! The other dog-centered event coming up, appropriately enough, is the Wurstminster Dog Show on Feb. 3, an art event and benefit for Dove Lewis, our local 24-hour emergency animal clinic. Over 100 international artists will be showing artworks representing over 100 breeds in many different media, from a five-foot plush doll to postcard-sized paintings, and GoodStuff friends Michael Wertz and Amy Ruppel are participating. The one-night exhibit will take place at the newly opened Ace Hotel at 403 SW 10th, the very hip and happening Portland branch of the Seattle venue. A portion of the proceeds of each sale will benefit Dove Lewis. We stopped into Laurelwood for a pint of their Moose and Squirrel, a dark and delicious Russian Imperial Stout, and heard that in the very near future, in addition to two new locations on NE Sandy and the airport, they're going to be bottling their roster of house beers. We're sure that this is being prompted by the popularity of their products, developed under the guidance of brewing wunderkind (and now master brewer) Christian Ettinger, who left Laurelwood last summer and is set to open his own pub and brewery, Hopworks Urban Brewery or the HUB, on SE Powell. His role has been taken over by new brewer Chad Kennedy, who is already showing promise as a successor to Ettinger. Their first location on NE Sandy in Hollywood was originally designed to brew 800 barrels and is currently producing 1800 barrels for their two locations and several discriminating restaurants around town. While the original brewery will continue producing their seasonals, the new Sandy location will take over and expand the production of their regular roster. Having ventured into the 1-liter bottling business with the huge success of the holiday release of their Organic Deranger, the new bottlings will initially be sold at the pubs. But I can only imagine that you'll soon be seeing them at various retail outlets in the near future. Which can only bode well for fans of the best of our great Portland brews. I had the good fortune to meet Kaie Wellman, local maven and originator of the Eat. Shop. series of guidebooks to some of the best places on the planet (including, of course, Portland). 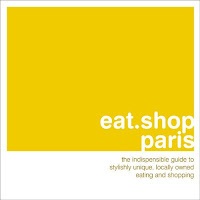 She recently released her 14th guide, this one a compendium of the best places to hang out in Paris, one of my favorite-est cities on the planet (no offense Seattle, Madrid, Seoul or Mexico City). Kaie and her co-author, Jon Hart, had their release party at Castagna, where owners Monique Siu and Kevin Gibson served some of the best munchies...OK, amuse bouches...that I've had this side of the Seine. The entire constellation of local glitterati ("Oh, darling, sooo good to see you!") were cheek-to-cheek in the dining room, making it hard to get to the goodies, though we did our best linebacker imitation and busted through. It was an amazing scene, though we quickly moved over to the cafe side and had a romantic and much quieter repast. Our friends from the Marqués de Valdueza olive oil estate in Spain let us know that that their estate olive oil has just been named a finalist in the "Mario Solinas" Quality Award competition, organized by the International Olive Oil Council, in which the best olive oil producers from around the world participate. The oil is pressed from four olive types grown on the estate: hojiblanca, arbequina, the rare morisca and the picual. Congratulations, guys, and big ups from GoodStuff! John Cancilla, who along with his wife, Ana, was the subject of a previous entry, sent along a photo from a lunch they attended (John is in the center) with Penelope Casas, a cookbook author renowned for her books on Spanish cuisine, and her husband (on the right). On the left is Juan, the capataz who runs the Perales estate, and next to him is the Marqués de Valdueza himself, Alonso Álvarez de Toledo y Urquijo. John suggests googling his name if you want to see what lineage is all about. And John says that if you're planning on attending the Fancy Food Show in San Francisco from Jan. 21-23, look them up at booth 452 and taste their new harvest! I know, I know, you're all tired of hearing me blather on and on about Foster and Dobbs but, sheesh, they're just blocks from my house and make a convenient place for Rosey and I to stop on our walks. Plus we love to chat with Luan and see what new stuff she's excited about. And then I get to tell all of you about it, so I guess you'll just have to sit back and, as my son says, "chillax." A new product they're carrying is called Oregon Dukkah (pron. doo' kah), developed right here in Portland by chef Donna Dockins. It's based on an ancient Egyptian recipe that combines nuts, sesame seeds and spices into a magical mixture that's great as an appetizer with bread dipped in olive oil and then in the dukkah, or by taking a roll of chevre and coating it with the dukkah and serving it spread on crackers. Luan likes it sprinkled on salads, and there's a clever little recipe book that comes in each package that has ideas for all five of their current products (coconut, smoky hot, sweet, traditional and zesty). I've tried the Traditional and the Zesty, and I'm looking forward to trying the others. The website has a list of stores that currently carry their products, so it's a good bet you can find it at a store near you. 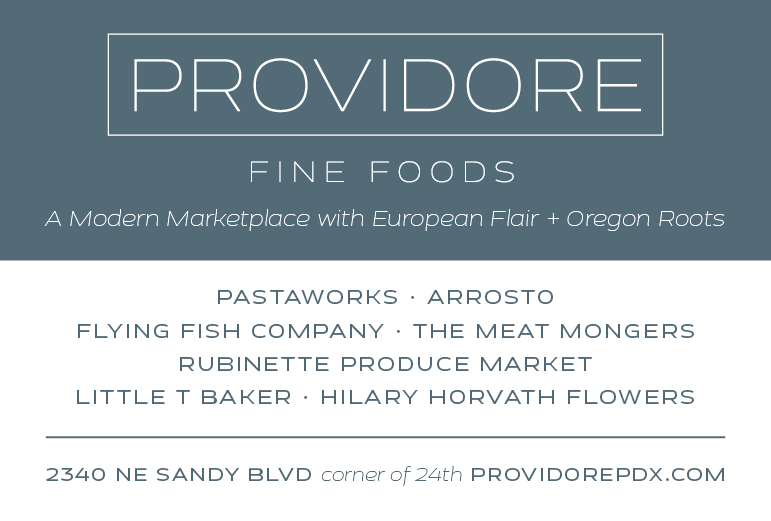 We are so lucky to live in Portland, especially those of us on the east side of the river, because of the profusion of great ethnic restaurants here. Name any part of the globe and you're pretty guanteed that Portland has a restaurant that represents that cuisine, from Russian to Lebanese to Moroccan to Cuban. 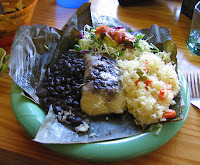 One that is not well-known here, however, is Salvadoran cuisine, with its pupusas and yucca and tamales wrapped in banana leaves. 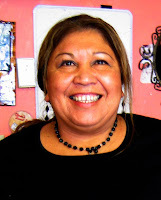 One person who's out to change that in a big way is Gloria Vargas, owner of Gloria's Secret Kitchen in Beaverton. Out of her pocket-sized restaurant she produces fresh pupusas, thick round pancakes stuffed with chicken, pork or cheese and her signature tamales, corn masa wrapped around big chunks of meat or cheese and steamed inside deep green banana leaves. Thursdays are delivery day to several New Seasons stores, who are starting to carry her products, and during farmers' market season she has a booth at the Beaverton Farmers' Market. At the restaurant you can get these and more, including chuletas, chipotle beef and daily specials, all served with some of the best black beans I've had in town, as well as a vinegary pink cabbage salad that accompanies most Salvadoran entrées, rice and fresh greens. Prices are very reasonable and you'll be glad you found this before the secret got out, because this woman is out to build an empire! Details: Gloria's Secret Kitchen, 12500 SW Broadway in Beaverton; Phone 503-643-2320. My old pal Steve Bloch has been on an extended trip to India and parts beyond and, after he'd been saying what a grand time he's been having and describing fabulous food galore, I said it would be ever so nice if he'd send some pictures to accompany his travelogue. Since he's a photographer and all. And especially since I love pictures from the road. So he has now obliged and sent some wonderful shots from his trip. 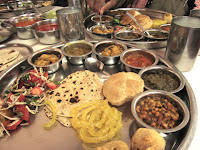 The photo above is from a meal that he described as "$1.50 for this bottomless vegi thalis." And his new favorite beverage? 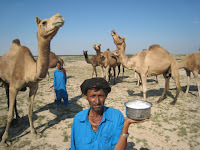 "Camel's milk taste a lot like I imagine fresh squeezed cow's milk tastes like...warm and sweet." For more oh-my-god-these-are-amazing shots, got to his web gallery and prepare to be knocked out.